Scott Butcher is an author, photographer, historian, presenter, and professional services marketer. 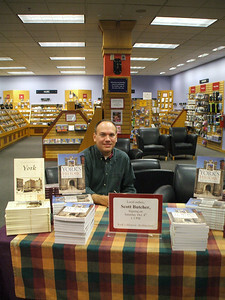 His books include Delaware Reflections, Gettysburg Perspectives, York: America’s Historic Crossroads, Tombstone: Relive the Gunfight at the OK Corral, York’s Historic Architecture, Lancaster County Reflections, York (Postcard History Series), Civil War Walking Tour of York, PA, Spooky York, Pennsylvania, Marketing in the Building Industry, and the upcoming Tucson Perspectives. Over 1,400 of Scott’s photos have been featured in books and periodicals. He is a Certified Professional Services Marketer through the Society for Marketing Professional Services, a past recipient of the Central Penn Business Journal’s Forty Under 40 award, and was recently named Leadership York’s Outstanding Alumnus of the Year for 2010. Scott also serves as Vice President of JDB Engineering, Inc. in York, PA.